Have you been to the Kadaugan Food Fest 2016? If not, this Friday might be the best day to go at the Liberty Shrine in Mactan, Lapu-Lapu City. Aside from the usual nightly entertainment and food display from top hotels and restaurants in the City, a major concert will be held at the neighbouring Mactan Newtown. 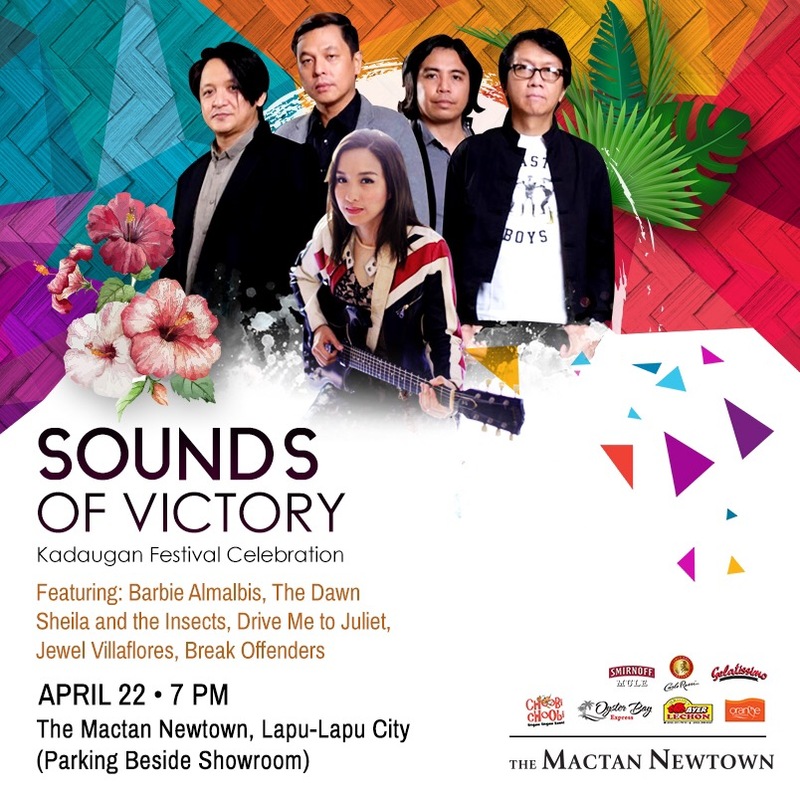 On April 22, 2016, in time for Kadaugan Festival Celebration, Barbie Almalbis, The Dawn, Shiela and the Insects, Drive Me to Juliet, Jewel Villaflores and Break Offenders will stage a concert entitled “Sound of Victory” at the Mactan Newtown, a few meters away from the Liberty Shrine. The concert is open to everyone but those who will have a minimum of 200 purchase at Mactan Newtown tenants/stores on the event date will be prioritized. While you are there, you may check the following activities within the Mactan Alfresco in Mactan Newtown. For dining and leisure activities, the township is home to the Mactan Alfresco, an outdoor dining strip inspired by Singapore’s famed hawker or food hall centers. The food strip features a varied selection of authentic Cebuano restaurants that are sure to be enjoyed by craving locals and tourists looking to dine on the best of Cebu’s cuisine. 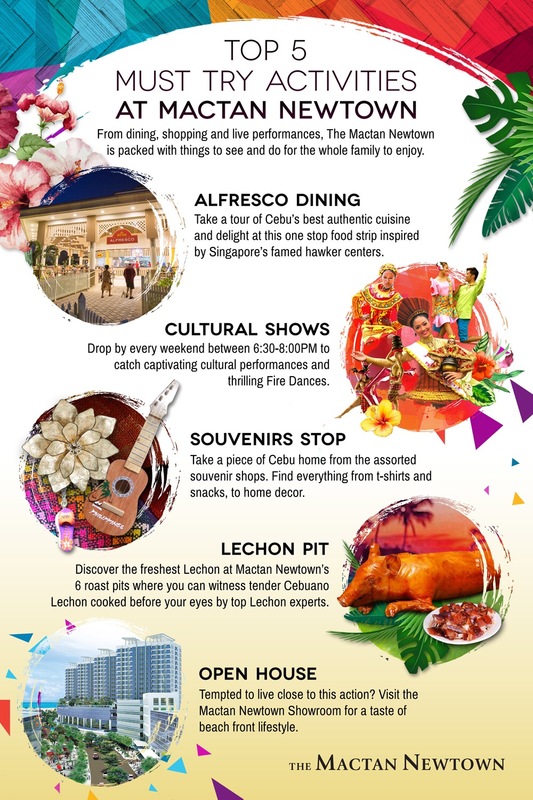 Find only the freshest Lechon at Mactan Newtown’s 6 roast pits where you can witness tender Cebuano Lechoncooked before your eyes by Lechon experts like Ayer’s Lechon and Anna’s Lechon. Mactan Alfresco also offers a cultural showcase every weekend. Guests can watch thrilling performances from 6:30-8:00PM to experience Cebu’s diverse culture and history. See traditional dances like Ritwal, Banga, Tinikling, Sinulog, Singkil, Subli and captivating Fire Dances performed on stage. Take a piece of Cebu home with you from the assorted souvenirs shops available at the venue. Find everything from t-shirt souvenirs, snacks, home décor and furnitureto make your trip more memorable. Tempted to live close to this action? Visit the MactanNewtown Showroom for a glimpse of the country’s first beach side township and the “Live, Work, Play, Learn” lifestyle offered by Mactan Newtown. The Mactan Newtown is a pioneer development offering Megaworld’s trademark township model.